A Keith Grammar student has won a national award following success in a Career Ready mentoring programme. 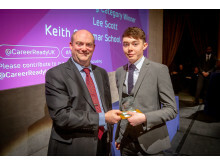 Lee Scott was named the AstraZeneca Science, Technology, Engineering and Maths (STEM) Engineering Student of the Year at a ceremony in London last night (Tuesday 2/4). The award recognises the students who have made the most progress towards a career in a STEM industry through the Career Ready programme. The award also recognises the student who can inspire others to consider STEM careers with their stories. 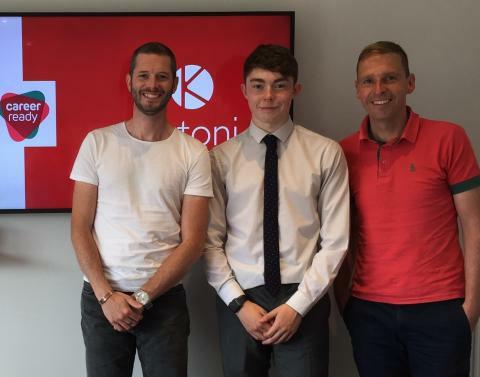 Lee, 18, has recently completed two internships at engineering firms in Keith and Aberdeen under the guidance of his mentor, Steven Dunbar, MD of oil and gas engineering company, Global Resources. Although a career in engineering was in his sights at school, Lee was lacking in confidence and unsure how to get there, even considering leaving school after S5 and trying for an apprenticeship. 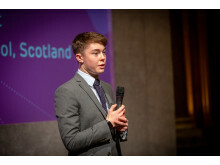 His teacher recommended that he joined the Career Ready programme, and through Moray Council’s Career ready programme he was teamed up with Steven as mentor. Steven used his network to arrange two internships, then mentored Lee through his next steps for his career choices. He said: “From our sessions together post-internships, I remain impressed by Lee’s new-found focus and maturity. Career Ready is one of Moray Council’s key offers to all secondary school students in their senior phase through the Moray Skills Pathway. Along with Lee, 38 young people graduated this year. In the current program 50 young people are being mentored by a large variety of local businesses, with Diageo as the main sponsor of the programme in Moray. With this level of support from business, Career Ready has grown rapidly in Moray as the benefits to industry and students are being realised. The combination of mentoring, internship and masterclasses provides a real insight into the world of work, and lifts horizons to the broad range of opportunities available here in Moray. Lee’s award follows hot on the heels of Milne’s High pupil Erika Stewart, who was named ‘Moray Student of the Year’ at last week’s Career Ready UK graduation ceremony in Perth’s Concert Hall. Erika was mentored by Diageo’s Project Engineer, Kevin Shortreed at the company’s Glendullan Distillery in Dufftown, Speyside.